'Transitional expressions' are words or phrases that provide bridges between sentences, parts of sentences, paragraphs and sections. 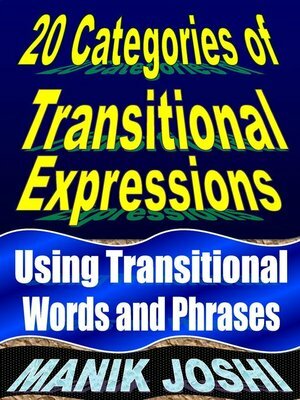 'Transitional expressions' connect and relate sentences and paragraphs. 'Transitions expressions' signal the relationship between sentences and paragraphs. 'Transitions expressions' state the connections between ideas. 'Transitions expressions' help carry over a thought from one part of a sentence to another, from one sentence to another, from one paragraph to another, from one section to another, or from one idea to another. 'Transitional expressions' connect ideas from sentence to sentence and paragraph to paragraph. 'Transitional expressions' are placed in the beginning, middle, or end of the sentences/paragraphs to explain connections between two or more ideas. 'Transitional expressions' help carry over a thought from one idea to another.